Enhance your lifestyle and property with style from our conservatory range. Brand Windows are experienced conservatory installers with thousands of satisfied customers in the Newbury and surrounding area. Our highly experienced installation team maintain a consistently high standard of installation with much of our business being obtained through recommendation. 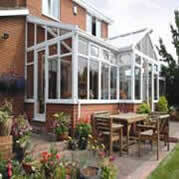 Our conservatories have many benefits that will add light and air to your property. 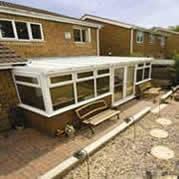 Conservatories will add value and valuable living space to your property. They can be contemporary or classic in design. The Edwardian style with its square front and clean-cut elegance maximises your usage of space. 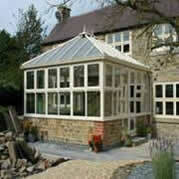 Inspired by Victorian design and architecture, the Victorian is one of the most popular styles of conservatory today. 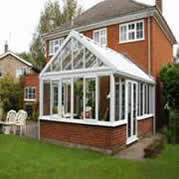 The Victorian conservatory will complement most type and size of properties. P shaped and combination conservatories create greater flexibility and stunning looks. The Gable End Conservatory's stately presence works well in both old and new properties.. The stylish and cost-effective way to link your house and garden. 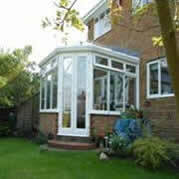 We had enough confidence in Brand Windows Ltd to have a conservatory and all our windows and doors fitted by them. Excellent survey and installation system. The installers were very experienced and quick – also very pleasant. As they are quite local I am very glad I tried them instead of a firm in Newbury who were not so customer- focused. On time, efficient, courteous workmen, cleaned up afterwards. Admin staff very helpful at all times. very pleased with resulting products. I have been very please with all aspects of Brand Windows service.